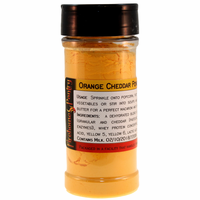 Product Details: Cheese powder tastes great sprinkled onto popcorn and steamed vegetables or stirred into soups, casseroles, dips, and pasta dishes. Whisk into freshly-cooked macaroni along with milk and butter for a perfect macaroni and cheese. Several of our customers even use it to make dog biscuits! 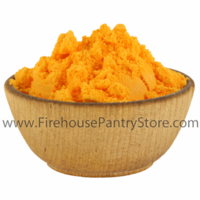 Bright yellow/orange in color and a salty, cheezy flavor. Shelf-stable; no refrigeration required; great for emergency food supplies, camping, RVing, boating, and hiking. Ingredients: a dehydrated blend of whey, buttermilk solids, cheeses (granular and cheddar [pasteurized milk, cheese culture, salt, enzymes]), whey protein concentrate, salt, sodium phosphate, citric acid, yellow 5, yellow 6, lactic acid, enzyme. Contains milk. Packaged in a facility that also handles wheat, milk, soy, egg, sesame, peanuts, and tree nuts. Shelf Life: The manufacturer lists a "Best By" date of 1 year from date of manufacturing, so once the product reaches you, it's about 10 months. However, we've found that when stored at room temperature or below in an air-tight container out of direct light, it easily lasts 2 to 3 years. Frequently Asked Question: Is this the same cheese powder that is in the blue box of macaroni and cheese and the macaroni and cheese topping in the 3 oz. blue canister? Answer: Not exactly, but it's pretty darn close.